No Time to Waste: Firm Up the Vote for the CRPD! You are here: Home / U.N. Convention on the Rights of Persons with Disabilities / No Time to Waste: Firm Up the Vote for the CRPD! This is the final moment and we have a busy week ahead. There will be a discussion of amendments on the Senate floor today. We are asking the Senate not to add any additional amendments. It is essential you and your networks contact Senators and let them know we are counting on their YES vote! We need to do two things. 1. Thank the Senators who joined our community and voted YES yesterday. 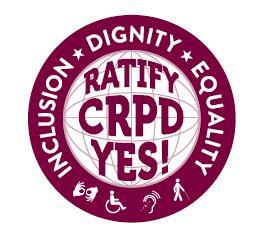 The message for these Senators is: Thank you for your YES vote on Tuesday for the CRPD! The disability community is with you! 2. Push more Republican Senators to join our ranks (we’re so close). The message for these Senators is: I am a disability advocate / person with a disability and I want you to vote YES on the CRPD with no new amendments! This is important to the disability community! All of your incredible work is paying off. On Tuesday, the Motion to Proceed on the Convention on the Rights of Persons with Disabilities passed in the Senate! See the vote count. The Motion to Proceed allows the CRPD to be brought up for consideration. Now that this hurdle is passed, amendments will be discussed and then, when the Senate Majority Leader feels confident we have the 67 votes we need, he will move to a final vote. Below are materials about filibusters and cloture (procedural issues that may come up). Follow us on Twitter and Facebook for updates – hashtags #CRPD or #UNCRPD! For more information on this work, contact Dara Baldwin, Policy Analyst, at dara@ncil.org and follow on Twitter @DaraBaldwin1!